Though this test is of the Audi A4 B6 Avant, elsewhere at HJUK you'll find a test of the new A4 saloon range. It covers driving impressions of the 130bhp 2.0 litre petrol manual, the 150bhp 1.8T petrol quattro manual, the 130bhp 1.9TDI five-speed manual; the 180bhp 2.5TDI V6 quattro six-speed manual and front drive versions of both the manual and Multitronic 220bhp 3.0 litre petrol V6s. Since that test Audi has broadened its engine range to include a 102bhp 1.6, a 170bhp 2.4 V6 and a 100bhp TDI PD. The Multitronic transmission has also become available almost throughout the range. So here I hope to bring you up to speed with the new developments. Audi is very keen on figures these days, especially those which affect company car drivers. The first rather surprising figure is that, at 4,544mm long, the A4 Avant is actually 3mm shorter than the saloon. But for company drivers paying 40% tax the more important figures are the BIK tax rates they will pay from next year in comparison to competitive cars. The important point to remember is that BIK rates are as much about CO2 output as they are about price, so a more efficient engine such as Audi's TDI PDs, or a more efficient automatic transmission such as Audi's Multitronic, can save you the cost of your children's annual school trip to Europe. 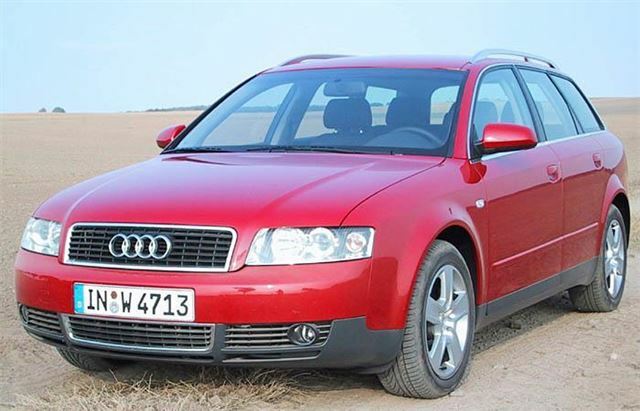 For the A4 2.0 Avant, 40% taxpayers will pay £1,647.96 in BIK tax against £1,748.04 for a BMW 318iSE Touring, £1,858 for an Alfa 156 2.0TS Veloce Sportwagen, and £2,453.92 for a Mercedes C180 Estate. If you must have an automatic, for the A4 2.0 Multitronic Avant the tax will be £1,681.20 against £2,051.40 for a Volvo V40 2.0SE automatic; £2,111.50 for an Alfa 156 2.0TS Veloce Selaspeed Sportwagen, £2,373.84 for a BMW 318iSE Touring, and £2,709.76 for a Mercedes C180 Estate. If you don't mind diesel, for the A4 TDI PD 130 Avant BIK tax will be £1,506 against £1,619 for a BMW 320D Touring; £1,630 for an Alfa 156 JTD Veloce Sportwagon, and £2,055 for a Mercedes C220CDI Classic Estate. 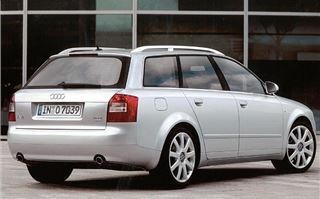 And you can save even more by opting for the slower A4 TDI PD 100 Avant, for which the BIK rate is £1,419. Another important figure is that, in almost all cases, Audi's slick new Multitronics are more economical, with lower emissions than the petrol versions. At the time of the test drive the range still wasn't complete, and there were no 1.6s, no 2.4 V6s,no TDI PD 100s, and no TDI PD 130 Multitronics to drive. I did get to check out the TDI PD 130 with its new six-speed manual gearbox; a TDI 2.5 155bhp with the six-speed manual; a TDI 2.5 155bhp with the Multitronic box; and a 3.0 V6 Multitronic. Fifth gear of the TDI PD 130 gives 28mph per 1,000rpm and sixth 33mph per 1,000rpm. The car will fairly easily pull 125mph, with some fellow testers reporting quite a bit more than that. But at the UK legal limit the engine is turning over at just 2,120 rpm and should bettering its official 75mph figure of 60.10mpg. The 2.5 TDI six-speed gives 34.5mph per 1,000 rpm, but was reluctant to pull more than 135.5mph at 4,000 rpm, though this did, of course, make it a very relaxed high speed cruiser. At the UK legal limit the engine is turning at 2,030rpm, so on a long, clear motorway run you could expect to beat its 75mph figure of 52.31mpg. The 220bhp 3.0V6 Multitronic was sublime both in traffic and on the autobahn, its fingertip transmission responding instantly at up to 6,500rpm and easily pulling an indicated 144mph. But the revelation was the 2.5 TDI Multitronic. At 37.5mph per 1,000rpm this is higher geared in top than the manual and topped out at the same speed. But, with the exception of the low rev limit of 4,500rpm, this is the most refined diesel I have ever driven. You never hear a trace of engine rattle, there's a wall of torque to pull it through the gears, and if you're in Multitronic mode and forget to change up at 4,500rpm the box simply does it for you. On the other hand, if, for example, you are descending a hill, and within rev-range, you can instantly change down to a lower gear and used the compression braking of the engine to keep your speed in check. In all other driving conditions the Multitronic transmission simply absorbs the undesirable characteristics of a diesel engine and drivetrain. Anyone prejudiced against oil burners should try this car. As with the A4 saloon, the A4 Avant exudes class and quality. Its size seems exactly right, in just the same way that an original, small-screen Sony Trinitron TV did compared to bigger, clumsier TV sets. 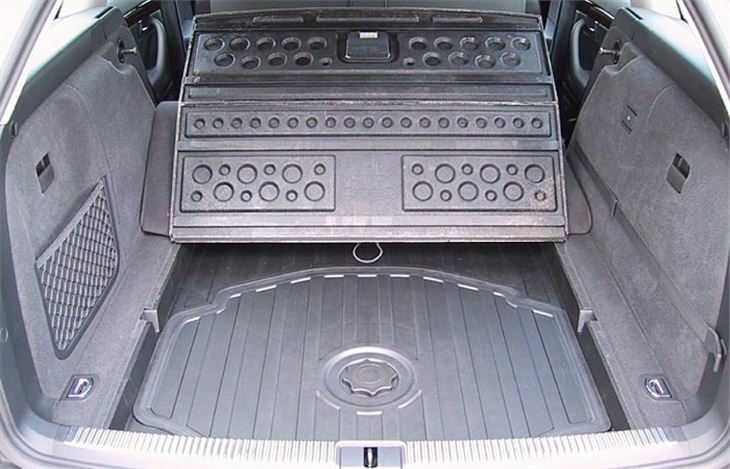 Yet the loadspace is also extremely practical for what is sold as a lifestyle estate car. The first thing that strikes you is the impressively square shape. No bootside bulges or suspension towers getting in the way, and a nice, useful flat floor. If you want, you can raise the floor to reveal a black plastic 'dirty' compartment beneath for hiking boots, wetsuits, or whatever. 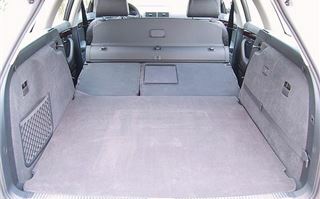 Alternatively you can buy a reversible load area liner, carpeted on one side but with scrubbable black bobbly plastic on the other. 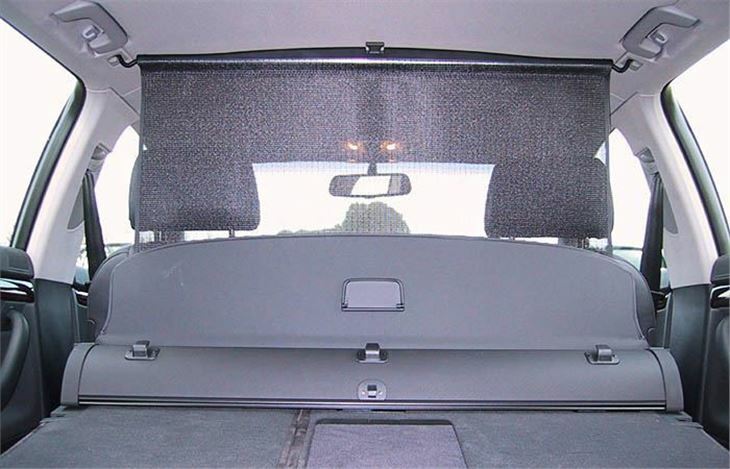 The load area is a useful 1,000mm (3ft 3in) wide, broadening to 1,357mm (4ft 5in) between the two rear doors. On the left side is a useful stowage compartment, on the right side a 12 volt power socket, and a clever accessory pack of nets and straps can be purchased to keep objects in place. 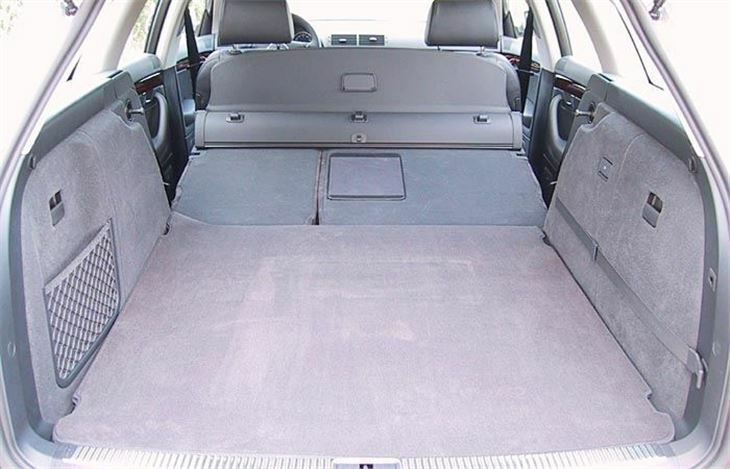 Each of the rear seats has its own lap/diagonal seatbelt. The centre armrest with a compartment for a medical kit can be folded down and a ski hatch opened for carrying long objects while four seats are occupied. The 60/40-split rear backrests easily fold down onto the squabs, taking with them a heavy duty cassette which prevents heavy items sliding forward into the front seats and also contains a self-tensioning barrier net which clips into the headlining very easily indeed. This cassette can also be completely removed, leaving a luggage compartment 1,787mm (5ft 10in) long. There was no safe opportunity on this exercise to push the car to its limits on corners. To get the story on that, road impressions of other engine and gearbox combinations and the new A4 generally, please refer to the A4 saloon road test. If the A4 saloon impressed, the A4 Avant impresses even more with its combination of classiness, quality, technical advances and practicality. 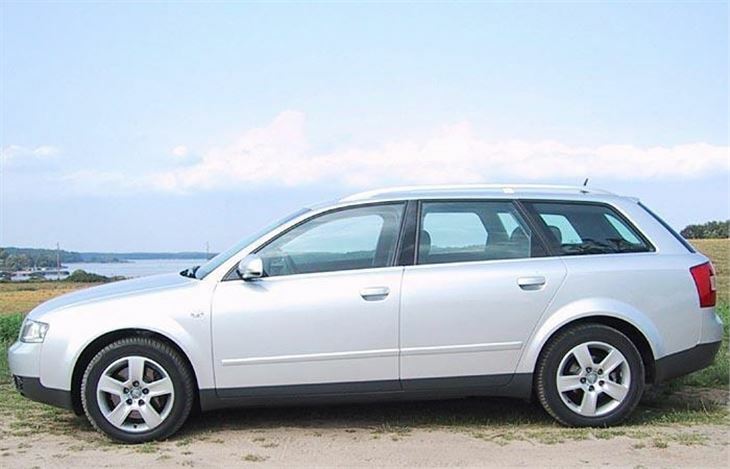 It got one German owner of the old shape A4 Avant so excited he nearly crashed his car into us.